There is more to all gardens than the green growing stuff. Hardscapes contain the elements that support, enhance or may even be the reason for the garden in the first place. As important as these non-plant features are they are often treated as after thoughts by almost everyone planning a garden. This is a big mistake for a number of reasons. Please visit The Art of Landscape Design under "Photo Tours & More" to read an expanded description of these garden subjects in Chapter IV, with Garden Gates 10 through 18 in our book "Gateways To Your Garden". Those are mostly, but not always horizontal non-living landscaped surfaces on the ground. Almost all of these elements will have a major impact on the site development budget. They are also often transition zones between the primary building and the gardens and their design should reflect their mutual associations. 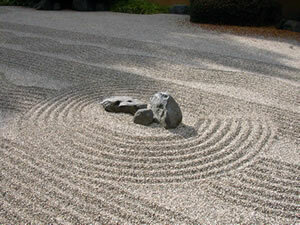 Boulders: Essential in rock and Japanese gardens, boulders can be important elements in virtually every garden type. Curbing/Edging: A concrete border or row of joined pavers, forming part of a gutter along the edge of a street. Decks: A roofless, floored area, typically with low sides, that usually adjoins another structure. Driveways and Parking: Autos moving in, moving out and staying put. Determine how much traffic you need to manage and design accordingly. Material Selection: A complicated issue. Design considerations, budget considerations, aesthetic considerations and community restrictions are just some of the many concerns. 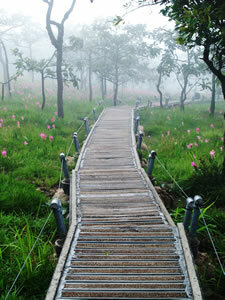 Pathways/Walkways: Moving many people through a garden is an essential concern. How many at any one time will determine volume and dimensions. 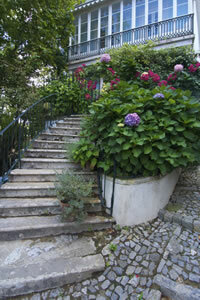 Garden usage that will determine style and budget may dictate the material choices. Patios/Terraces: Entertaining just a few, or a lot of people and how frequent are these gathering places to be used will determine how large and complex these surfaces must be supplemental seating and a place to display container plants and art objects. Ramps: Ease of access for the handicapped to an upper level dictates the need for a ramp. Consider the movement of wheeled equipment by incorporating raised curbing on the sides. Retaining Walls: These structures are needed to keep soil in place and provide transition from one level to another. Steps: Sometimes the length (tread) and height (risers) area determined by law, but most often other design considerations will decide how utilitarian or graceful you want your steps to be. Stone: As a hardscape item, stone can come in the form of precast concrete or natural stone, cut flat and used as step stones, flagstones or fitted and grouted pavement in patios and terraces. Tile: These are hard relatively thin pieces of fired clay, stone, or concrete or even plastic, used especially for roofs, floors, or walls, laid in patterns to cover terraces, patios, pools and on walls in the landscape venue. 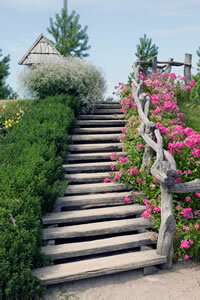 Wood: As a hardscape item, terraces, decks, patios, walks, bridges and steps are some of surfaces made from wood. These are constructed elements that are often a major part of the landscape and usually have a great impact on the overall garden design and the budget required to complete the project. They can add drama to the garden and take lead roles in establishing atmosphere and to establish or support the primary garden theme. In all cases, attempt to follow the architectural or design integrity of the whole when designing these elements into the gardens environment. Aerial Hedge: These are usually small canopy trees planted at equal distance from each other and allowed to overlap. The canopies are then trimmed into tight, sometimes formal hedge shape. Amphitheater: A level area, usually round that is surrounded by an upward sloping ground and used for outdoor entertaining such as musical performances, actors in the round or oral presentations. Arbors: These are overhead gateways from one part of the garden to another, often supporting flowering or fruiting vines. Atrium: In landscape terms, this is a central area within a building containing plants. These features were popular in the center of an ancient Greek and Roman houses. Aviary: A large enclosure for holding birds in confinement. Badminton: A sport played by volleying a shuttlecock back and forth over a high, narrow net by means of a light, long-handled racket. Basketball: A game where the object is to throw the ball through an elevated basket on the opponent’s side of the rectangular court or more likely in a typical residence to do the same in a net suspended from a garage front. B-B-Q: The American tradition. A moveable grill may satisfy the occasional use, but if the family and guest usage is large, design in the best equipment, fuel supply and adequate space within your design. Bridges: These can be footbridges, golf cart bridges or large vehicular bridges that facilitate passage over lower areas or water streams. Cabana/Pool House: This might be a shelter on a beach or at a swimming pool and often used as a bathhouse or even as an apartment. They are sometimes self-contained with a kitchen, bed, bath and living areas. 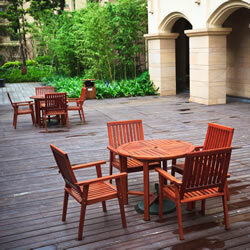 Courtyards: Privacy, security or just plain charm make garden courtyards a very desirable option. They are viewed from inside the house more intensively than most outside gardens and require utmost care in their design. Croquet: An outdoor game in which the players drive wooden balls through a series of wickets using long-handled mallets. Entranceways: Usually the most visited part of your home, and often the most overlooked. Attempt to make more than the door style a design statement in this important area. Fences/Walls: Don’t place a fence or wall into your design just to have one. They visually confine a garden vista and dampen neighborly feelings. There are also good reasons for an enclosure but make a conscious design decision to have one. Firepits: People sitting around an outside fire seem to satisfy something deep within our psyche, or at least harkens back to simpler days at camp. This easy and inexpensive item can be very satisfying. Furniture: Attempt to provide comfort and practical utility along with excellent design consideration to complete your garden design theme, while interacting well with the interior furnishings. Frisbee: A trademark name used for a circular plastic disk-shaped that spins and soars on the air when thrown. Gazebo/Pavilion: Covered gathering places in the garden have great appeal. Coordinate your gazebo design with your home architecture or garden theme, determine appropriate size and enjoy it. Golf Practice Spaces: This garden element is usually restricted to putting or chipping activities that takes place on very fine bladed and smooth grassed areas. Grotto: An artificial structure or excavation made to resemble a cave or cavern. 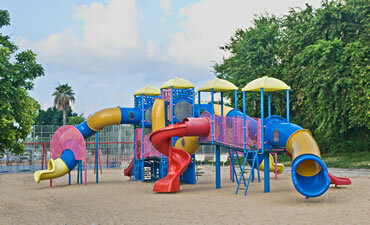 Jungle Gym: This is a structure constructed of poles, step, bars and straps for children to climb and play on. Lanai/Porch/Veranda: Almost always covered, these areas may or may not have a hard surface. Basically they are garden spaces adjoining the house in some manner. Maze: An intricate, usually confusing network of interconnecting pathways, as in a garden or a labyrinth. Pergol’s: These are overhead trellises that alter the intensity of sunlight and provide support for vines or hanging baskets. Coordinate their design with your architectural style. Playground: An outdoor area for recreation and play, especially one containing equipment such as seesaws, swings, jungle gyms and other structures for children to play on. Promenade: A graceful walk from one place to another, usually for more than one person. Design these spaces to be comfortable with the landscape they move through. Sand Box: A low box filled with sand for children to play in. Seating: As garden structures, these units are generally built in and permanent units in the garden plan. Service Yards: Certain areas of the garden might be used as service or utility areas to house equipment or provide a workspace that will not impact on garden aesthetics. Steps: Steps are not just for utility. They can be graceful, unusual, rustic, majestic or look so natural you won’t know a designer created them. Storage: These are structures for storing garden supplies, usually out of the effects of weather and humidity and often within the garden environment. Tennis Courts: A game played with rackets and a light ball by two players or two pairs of players on a rectangular court of grass, clay, or asphalt or other synthetic material and divided by a net. Theater: This is an outdoor structure, usually open for the presentation of plays, films, or other dramatic performances or just for television viewing on a patio or terrace. Tiki/Palapa: Generally tropically rustic in appearance, but not always, these thatched roofed structures are used for entertainment or to establish a tropical theme for the garden. Trellises: Either free standing or mounted to a wall, these structures provide climbing vines with proper support and when well designed, keep the vegetation away from the sidewalls to avoid any moisture buildup. Volleyball: A game played by two teams on a rectangular court divided by a high net, in which both teams use up to three hits to ground the ball on the opposing team’s side of the net. Walls (free standing): Great for wind breaks, privacy and ideal for a backdrop for plantings beds. 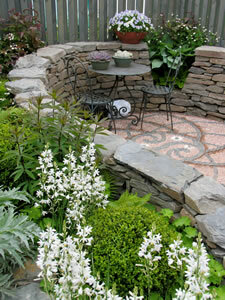 Sitting walls can retain soil or provide grade transition and serve as extra seating on a terrace. Windscreens: These are both vegetative and non-plant screens for protection against the wind, often but not always located on terraces and patios. Nothing provides interest in the garden quite like a water feature. These elements have water as their primary focus and may be based on natural occurring compositions such as streams, ponds or waterfalls or as purely decorative items such as fountains or pools. The movement of water provides liveliness to the landscape by adding a range of sounds from a light tinkling to a deafening roar. The tendency of water to reflect sunlight, moonlight and images of people and nature that surround these features can bring considerable pleasure to observers. The aquatic environment itself supports many delights that include colorful fish, unusual plant life and occasional visitors such as birds and animals looking for a drink or bath. Water features provide unlimited hours of pleasure and even draw people who are usually indifferent to gardens into the landscape to connect with the sounds and sights of nature. They also tend to increase the value of real estate, or at the very least provide significant extra added value because of their appeal to prospective buyers. Fountains: Water rising upward out of the water to create various patterns in the air or cascading downward from a ledge of some sort, establish a garden theme like nothing else can. 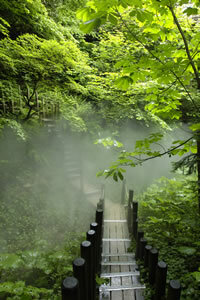 This is a great way to create atmosphere or mood within the landscape. Water Bowls: Mounted on a wall or pedestal, these decorative plaques and bowls normally recycle water from a holding basin to a spout and back into the basin, all self contained. Ponds: Large and small, these basins hold water to supply fountains and waterfalls, grow water lilies and more, house fish and other marine organisms. This is a great medium in which to express creativity. Reflecting Pools: Generally these are formal, relatively shallow water features that reflect trees, garden ornamentation or just the sky. 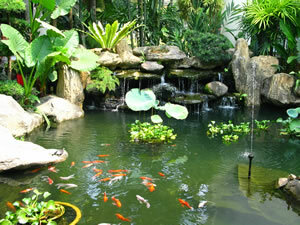 They may contain fish and vegetation but most often have clean recycled, purified water. Spas: Therapeutic in their usual concept, these small pools seat people on underwater ledges and provide pulsating jets of heated water. Very social and comforting, there is great value to the family in having one of these watery retreats. Swimming Pools: This garden structure will dominate your outdoor plans. The size and design complexity for swimming pools are dictated by projected family or guest entertainment needs. Watercourses/Streams: If you had one of these features naturally on your property, you would have paid a premium on that property and would be happy to have done so. 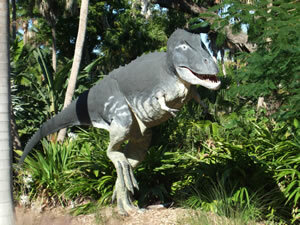 Adding one to your landscape will also bring many hours of pleasure to you and your guests. Waterfalls: Water falling from heights delights everyone. They can be part of a watercourse, fall into basins at their base or even into a swimming pool. The sound of falling water can be varied from a trickling to a roar. These issues are often very important in your planning and many are essential when establishing your design parameters and certainly when budgeting. Others issues are rarely even considered when the design process is started, but they should and must be considered at some point before the design process is complete. Disabled Planning: For the public garden, planning for the disabled is required. For the private garden, this planning is nice and a considerate thing to do. Horticultural Labeling: Gardens with extensive or unusual plantings often need a method of identification to inform observers. Avoid looking like a nursery with metal ID stakes, by using small copper or stainless tags on the plants. Irrigation: Sprinkler systems must be designed to water everything at appropriate rates. Landscapes must be designed to facilitate that aim. Don’t mix plants that abhor water with those that have an excessive need for it together in one adjoined planting bed. 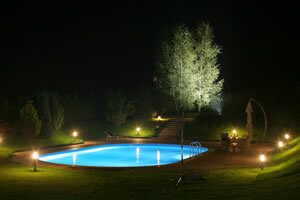 Landscape Lighting: Extend the enjoyment of your gardens into the night and do it creatively. Insure movement through the nightscape is safer by proper illumination and in the process make illegal entry more difficult. Tours: Many public and private gardens offer tours. If this is to be expected for your gardens, insure that pathways and gathering spots are wide enough and insure ease of movement throughout. Support the tour with plans and graphics. Maintenance of the garden is a reality issue for the client and a proper and considerate design issue for the landscape design professional. Planning on maintenance needs from the beginning of the design process can have a large and positive impact on the ease or difficulty in taking care of the eventual garden. The landscape design professional must focus in on this subject and discuss it with the client in order to set maintenance priorities and eventualities together. Feeding/Fertilization: Individual plant needs affect garden bed companionship issues. Excess nutrient runoff issues affect the quality of waterways and ponds negatively. And then there are the budget issues. Insect, Diseases &Their Control: Some plants are more trouble than they are worth due to anticipated disease and insect susceptibilities. Keep their presence minimal or totally omitted if they are not essential to the overall design. Irrigation: Management of the sprinkler system is as important as the system design itself in regards to efficiency and costs. The landscape design professional must design a program that allows the client to be in control of its operation. Mowing and Edging: In most gardens a lawn is desirable or perhaps required, as in many gated communities. It is best to keep grass volume below 50% of the total landscape area to promote water conservation and ease the labor burden of mowing and edging. Trimming/Pruning: Competent gardeners willing to perform trimming chores are hard to come by. Therefore design the garden with just the amount of trimming intensity that you are prepared to handle on your own. General Maintenance Concerns: Keep the grounds maintenance needs in mind and don’t make mowing, trimming and other requirements more complicated than necessary, for those that will be taking care of the garden. Like it or not, unless your project is in a rural venue, your gardens are part of the neighborhood and the community in general. You should be prepared to interact with them and consider the mutual rules and regulations. Environment: We are all part of the environment we live in and being the stewards of that environment is an important social obligation. The client and designer must work together to protect and improve on those concerns. Impressions: The community you live in will most likely abhor either a minimalist or an ostentatious landscape statement. They will always appreciate a well-conceived and relevant addition to their community. Neighborly Concerns: Whatever we design regarding the outwardly visible aspects of the landscape will have an impact on our neighbors. Insure that the client’s pleasures are also pleasurable to the neighbors to the highest degree possible. Obligations: The property owner has an obligation to the community to keep design standards up to expected levels. Don’t minimize the importance of this obligation. Permitting/Government Reviews: Municipal regulations can greatly affect your design. Become educated in the process. There are almost always ways to meet the governments and the client’s goals. Review Committees: If you live in a gated community, you generally can’t avoid their review committees. Study their publications and attempt to know the current committees likes and dislikes. It is of utmost importance that the client and landscape design professional establish a budget in the first phase of the design process. Too many landscape projects are almost derailed late in the course of designing because the subject was never brought up. By considering all of these expenses from the beginning and placing priorities on the various expense categories, a smoother and more accurate design program can be implemented. The following major categories of landscape expenses must be analyzed and projected. Use them in a checklist to assist in a decision to incorporate an expense or eliminate one from your consideration. Some expenses will have a huge impact on your budget and some will be quite small. But the small impacts, gathered together can create an important line item budget and should not be overlooked. Containers: Don’t underestimate the potential high cost of good containers and picture perfect plantings in pots. If they are important to your finished design, plan for them. 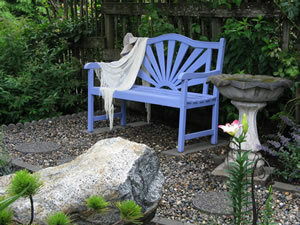 Design Fees: Your may obtain an up front quote or have the fee included in the planting contract. Be prepared for an amount upwards to 10% of the proposed landscape contract in normal cases. Drainage: Depending on your sites topographical complexity, you may require underground piping or just surface water drainage systems to avoid standing water. Don’t assume you won’t have to budget for this element. Drives/Parking: Width, length, amounts and material selection will all impact considerably on cost and could cause your budget to soar. Energy Expenses: Whether these costs are for electric consumption to run pumps and landscape lights, or fuel for BBQ, lawn mowers and other equipments, some consideration must be made for the energy costs to maintain the grounds. Environmental Permits: If the project is within or adjoining environmentally sensitive areas, it is likely that an environmental permit will be required to install landscape elements within their jurisdiction. This often necessitates using professional help other than the landscape design professional and the costs of doing this must be considered. Fencing and/or Walls: Either for privacy, safety, security or enclosure of utilities. This could be another major line item in your budget planning. Garden Accents: Perhaps this selection will be a small ceramic garden gnome or a major bronze sculpture. Consider your goals in this area. 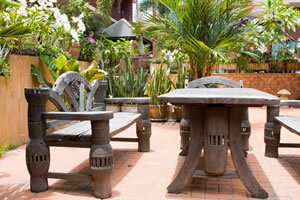 Garden Furniture: Some chairs, a table or two, chaises, benches or even sitting walls can fall in this expense group. Garden Structures: Pergola’s, trellises, gazebos & pavilions, greenhouses and maintenance houses are a few of the possibilities. Grading: Smoothing the site, creating swales and berms are some of the considerations. Grounds Maintenance: The client may perform the mowing, edging, trimming and all the other maintenance chores or it may be contracted out. The decision must be made and the annual costs determined. Hose Bibs: Often overlooked, some people want hose bibs every 150 feet or so around the house to clean things, water things or even wash the house or gutters to rid them of attached insect nests. Irrigation: Often required in gated community and always desired if a landscape is to be properly grown and maintained. Landscape lighting: Extend your daytime garden enjoyment into the night and provide additional security. This could be expensive for good quality fixtures or to create dramatic lighting effects. Plantings: This is the first expense everyone thinks of and it is definitely a major one. The cost of trees, shrubs and ground covers are usually quoted with the labor to install them included. 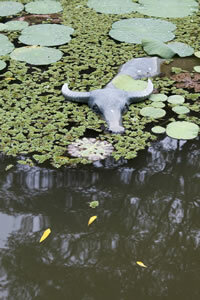 Pools/Water Features: Swimming pools are not usually in a landscape budget, but ponds, waterfalls & watercourses are. 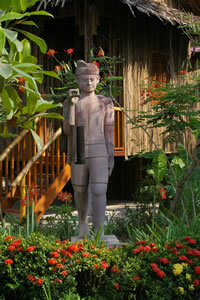 Sculptures: These strong design elements can be supplied as a small accent or even be the theme established for the entire garden. 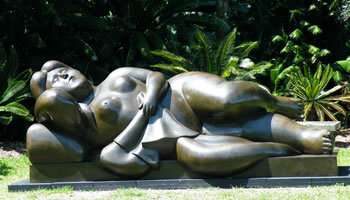 Sculpture gardens usually have all plantings and other elements supportive of the sculptures being displayed. Site Clearing: From under brushing to tree clearing and hauling the debris away this could be a big expense. Soil and Additives: The existing soil on your site may have to be reclaimed, improved upon or added to in order to provide a good landscape base. Supervision/Consultation: You may require that your landscape design professional take responsibility for overseeing the supply and installation of various portions of the project. Their fee may be included in their design fee, negotiated with the client or performed on an hourly rate basis. Terraces: Often terraces are added to the original architectural plans for landscape purposes. Consider your needs in the beginning of the design process. Tree Trimming: In addition to site clearing, many trees will need major care to put them in good condition, preferably prior to landscape installation by pruning, shaping and trimming. Walks and Pathways: Movement from one landscape point to another in the garden can become an important budget consideration in any plan. These groupings are offered for landscape planting considerations and provide a brief description on your “green stuff” selections. Edibles: Fruits, nuts, vegetables and herbs are great to have and fun to grow. But they must be planned for to have optimal growth and care environments. Flowers: Flowers are highly desired and cultivated for their beauty, scent, and decoration and even eaten on occasion. They decorate a garden like nothing else or used as cutting blooms and brought inside to brighten up the interior of a building. Ground Covers: Lawn grasses are the main ground covers, but gardens may be more practical when other low maintenance ground covers are selected. Insure that the selection of ground covers is based on the needs of the site in regards to soil conditions, climate, and water and sunlight influences. Hedges: These plantings define a space, provide barriers, outline forms, create backdrops and perform other creative and useful functions in the plan. 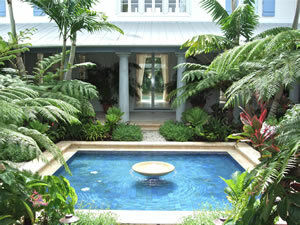 Palms: Where climate permits these plants are very desirable to establish a mood or fulfill a garden theme. They can be large trees used for shade, framing or emphasis or small shrub like accents used in a mass planting for privacy or design structure. Shrubs: These are the plants used for hedges, shrub masses, accents, color, and privacy and they usually dominate the landscape plan. Trees: These plants have a canopy and trunk and they may be small accents or large shade makers. They may flower, fruit, hold onto or drop their leaves. They may have needles, leaves or fronds. Vines: Some vines climb on supports and some run along the ground. They may have flowers and fruit or they may just be green or various shades thereof. Vines are a weak-stemmed plant that derives their support from climbing, twining, or creeping along on the ground. Some of the more spectacular and popular vines are bougainvillea, wisteria, climbing roses, honeysuckle, confederate jasmine, grapes, various melons, pumpkins and many, many more. 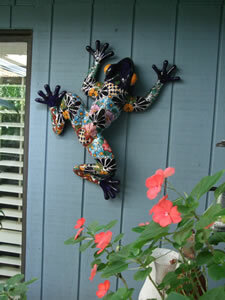 They are very useful for quickly covering up walls or for clambering on arbors, trellises and pergolas. 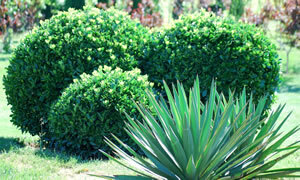 Many plants have specific varieties that are available as shrubs or vines. 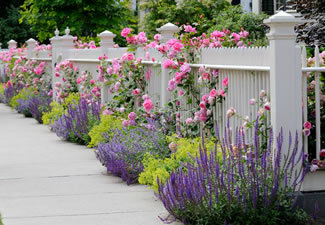 When you work with a landscape design professional and receive a landscape plan, what features will you be reviewing? What should you look for? The following listing will help suggest points of focus that will familiarize the client when reading the plan and working with their designer to better reach their landscaping goals. 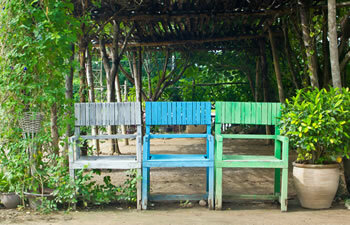 Tours and Excursions: Field trips to gardens can be very illuminating for both the client and designer. Take whatever time is required to familiarize each other with the design possibilities seen on these trips. What to expect from the landscape design professional: Expect a computer generated or hand drafted landscape plan along with a set of specifications detailing the design goals that were developed from the client and designer deliberations in previous sessions. How to read the plans: Have your designer explain how to read the symbols and explain theory used to create the plan. What the client can request: Artists renderings, plant/materials selection photographs, construction drawings and other data are usually available for an additional charge. Publications as design tools: Usually upon request, your architect/designer will recommend or supply support publications to assist you in understanding you’re proposed landscape and issues. Requirements for review and permits: Landscape plans submitted to review entities for permitting purposes must first be reviewed and approved by the client. Installation detail: Instructions to the landscape contractor in the desired methods to plant and secure the new trees and plantings are prepared by the designer and discussed with the client.